Baselworld 2017 is scheduled for March 23 to 30, 2017 in Messe Base, Switzerland. Baselworld is the premier watch and jewellery industry show in the world. 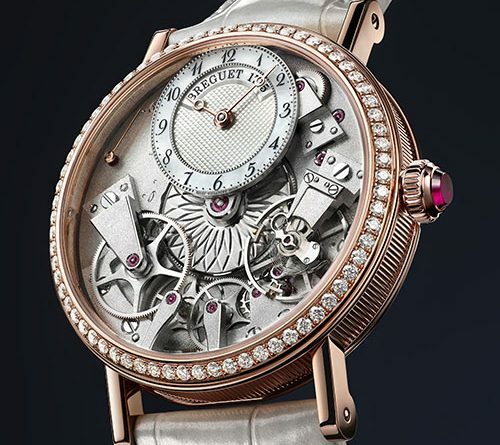 Leading up to the big event, luxury brand Breguet is focusing on women. The company introduced their new Tradition Dame 7038 luxury watch. This beautiful new women’s watch is a version of its popular, Tradition Dame watch model. The Tradition collection was introduced to the luxury watch industry in 2005. After creating several incredible watch models, this elite collection now includes the gorgeous, rose gold Tradition Dame 7038. The Tradition Dame 7038 is self-winding timepiece with a creative mechanical horology. While leaning toward the male market in the past, the Tradition Dame 7038 watch is truly feministic. The watch dial is absolutely stunning. The barrel of this new luxury watch comes hand-engraved with a rosette motif. It’s overlapped at the 12 o’clock position with a petite offset dial, in natural white mother-of-pearl. The sandblasted bridges and mainplate have been rhodium-plated. The result is an incredible contrast against the luxurious, rose gold case. The Breguet hands are rose gold open-tipped. Therefore, reading both the hours and minutes is simple and seamless. The watch bezel of the Tradition Dame 7038 is adorned with 68 brilliant-cut diamonds. The total weight is about 0.895 ct. In addition, you’ll notice a watch jewel is perfectly set to add a finishing touch to the crown. This latest watch from Breguet is equipped with the Calibre 505SR movement. Featuring a lever escapement with silicon pallets, plus balance-spring that is made of silicon as well. The craftsmanship of this ladies watch is impressive. The case is 37mm in diameter and made from 18k rose gold. The caseband has been carefully fluted. It features a sapphire-crystal caseback and is water-resistant to 3 bar (30m). What makes each watch unique is they are all individually numbered and signed Breguet. It has a 50 hours power reserve is completed with a fine leather strap. The Breguet Tradition Dame 7038 would make a perfect gift for that special woman in your life. Your wife, mother, fiance or girlfriend would simply love owning a wearing a luxury watch like this. It’s sophisticated look would turn heads at any social gathering. At the time of this publication, Breguet has not announced the price of this watch. Please contact The Life of Luxury to learn more or purchase the new Tradition Dame 7038 watch from Breguet. Return soon to follow our luxury blog and read about the latest news in the luxury watch industry.